"This is a delicious and easy dessert to make, short in ingredients and time. This is also a no-bake dessert, which makes it a summertime favorite! 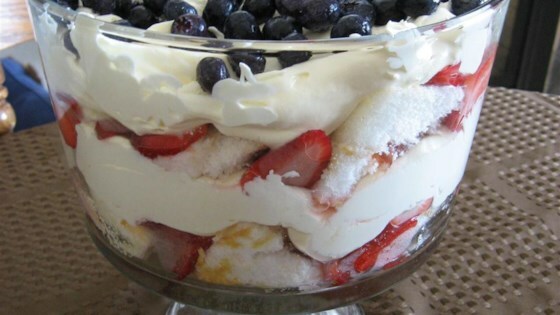 Looks beautiful in a trifle bowl. Great as a birthday or holiday dessert. Depending on how many people you are serving it usually does not last more than 1 day in my house! This can also be easily modified with other fresh fruits, but strawberry is our favorite! Pound cake cake work in place of angel food. Enjoy!" Toss strawberries and sugar together in a bowl; refrigerate for 30 minutes. Beat milk and pudding mix together in a bowl with a whisk for about 2 minutes; fold whipped topping into the pudding mixture. Slice angel food cake horizontally into 3 layers. Spread strawberry jam onto cut side of 1 layer putting it together with one of the remaining layers; cut into 2 inch pieces. Spread jam onto the remaining layer and also cut into 2-inch pieces; sandwich pieces together. Layer about half the cake pieces into the bottom of a trifle bowl; top with a layer of about half the strawberries. Spread a layer of the pudding mixture atop the strawberries. Repeat layering. Top with blueberries. Cover bowl with plastic wrap and refrigerate for 4 hours. This can be stored in refrigerator overnight before serving. this is a crowd pleaser. I skipped the strawberry jam and just layered the angel food cake. Tried it for special company and they loved it. Did not change a thing. Lots of compliments on this one. Light and fluffy.